Laser Hair Removal: Say Goodbye to Razors! Body hair removal is a hassle that plagues most women and men. Whether you shave, wax or tweeze, these are temporary remedies that are painful and messy. With the latest in laser technology, hair removal just got easier! The areas that are commonly treated include legs, armpits, upper lip, chin and bikini line. However, it’s possible to treat unwanted hair in nearly any area. It’s the hair colour and skin type that influences the success of laser hair removal. Offering unrivalled skincare treatments, Rebecca continually sources pioneering treatments and skincare products at Euromed Clinic Center. She has built a reputed name for herself, and is considered a key figure in skin care among the region’s most prominent media, influencers, as well as Middle Eastern royalty. Laser hair removal is a medical procedure that uses lasers, harnessing the pulsating beam of light to remove unwanted hair. 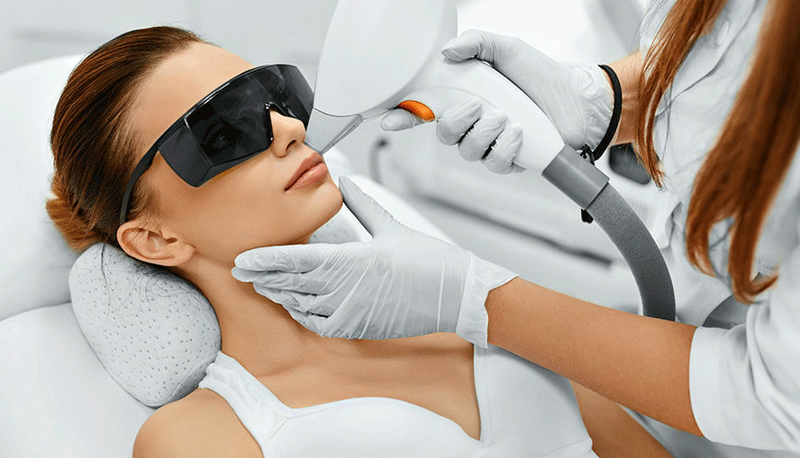 The laser emits a gentle light beam through the skin to the hair follicle. The energy transforms itself into heat which destroys the hair follicle and inhibits future growth. The surrounding skin is left unaffected thanks to a cooling device in the laser machine. Laser hair removal has always been most effective for people who have light skin and dark hair where the hair is very visible. This is because the laser beam targets the pigment (melanin) in the hair. People who have darker skin can also opt for laser hair removal, but traditionally the laser beam may also affect the melanin in the skin. Laser hair removal hasn’t generally been effective for white, blond or gray hair. But new technologies are changing the game. The Quanta Duetto provides an unrivalled level of flexibility by emitting two different laser wavelengths independently, simultaneously or sequentially. It is safer than its predecessors, and gives more effective results on tanned skins and hairs with very little melanin content (blonde/red hair). Equipped with the latest technology, laser hair removal in Dubai offered at Euromed do provide permanent hair reduction. While it may from person to person, on average anywhere between 70-90% hair reduction can be achieved. Only occasional maintenance is required once or twice a year. Unlike other treatments, people who have already tried it at our clinic say that it causes you zero pain, is completely mess-free, and saves you the inconvenience of down time. Results may vary from person to person, but usually a minimum of six sessions are recommended. When you book your consultation with Rebecca, she will advise the best package for you based on your skin type and hair before embarking on the treatment. If you want to put an end to tedious hair removal hacks, book an appointment at Euromed today, a leading Laser & Skin Care Clinic in Dubai. Rebecca and her team will make sure that you leave us with flawless skin, feeling radiant and confident as ever!